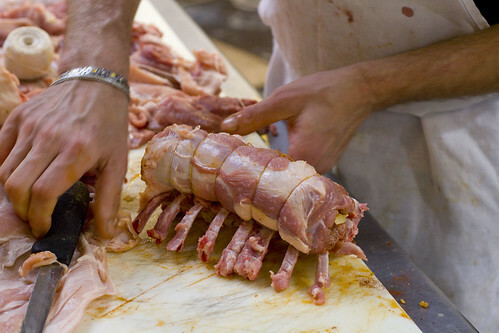 A couple of weeks ago, I got an e-mail asking if I’d like to go to a butchering class. Really? Of course I would! And more importantly, I could pass this off as a Valentine’s Day present for Lon. 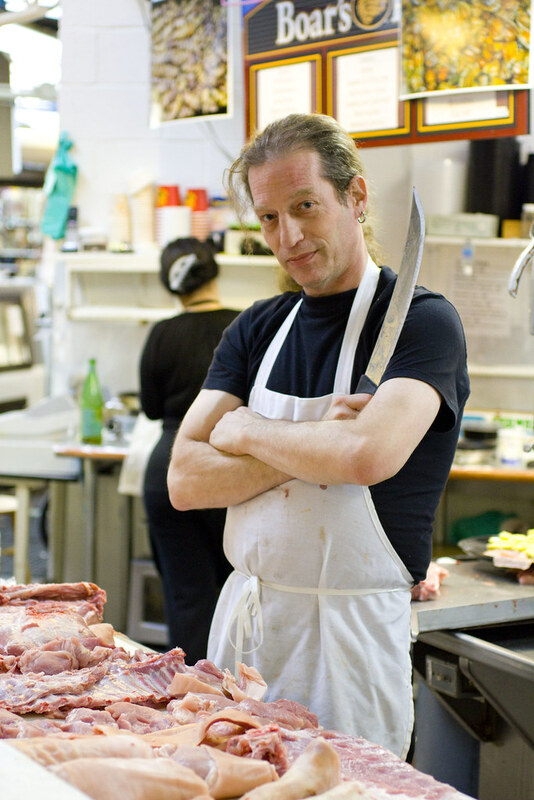 Lon loves butchery! It get’s better. Jeffrey’s Meat Market 120 Essex Street, New York, NY 10002 (inside Essex Street Market) holds a class every weekend, rotating through pig, beef, lamb, fowl, and I got to choose. 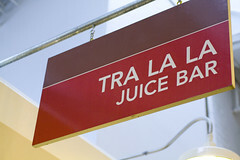 First Jeffrey Ruhalter ushers the class over to Tra La La Juice Bar 120 Essex Street, New York, NY 10002, insisting we try the muffins (included in the cost of the course). 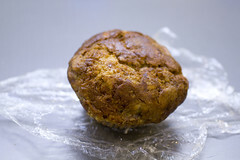 The muffins were as wonderful as he promised, rustic with random large chunks of pear in mine, banana in Lon’s. I would never have thought of not chopping the nuts in the muffin but these whole pieces worked. It tasted natural and fresh. They were still warm from the oven and a steal at $2. Not to be missed. This is a two minute re-cap of a 3+ hours class. *If you’re squeamish about animal parts, do not watch the video! Following Emeril Lagasse’s lead, sanitation is thrown to the wind, but what Jeffrey lacks in cross contamination prevention, he makes up for in generosity. He is determined to make sure you leave with more than you could have imagined. In fact, looking at the price of $75 per person, and counting the tastings and portions you take home (seems like each person got at least 5 lbs), we figure there is no way Jeffrey can even break even. What is this, a charity? I wouldn’t be surprised. Jeffrey was giving samples to all that passed, including vagrants, and it started becoming apparent that these stragglers knew him and came to him regularly. As Jeffrey finished up the class, he decided to do more than just give me some pork, he was going to prepare the rack of pork for us. 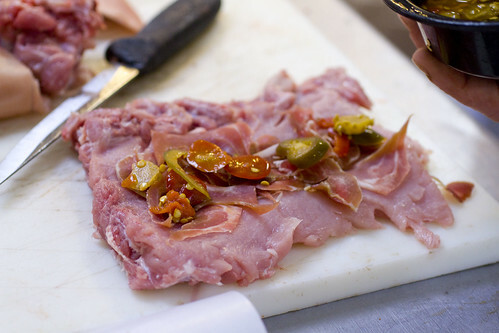 He took it off the bone, filleted it, and layered it with proscuitto, sweet and hot peppers, and gruyere. 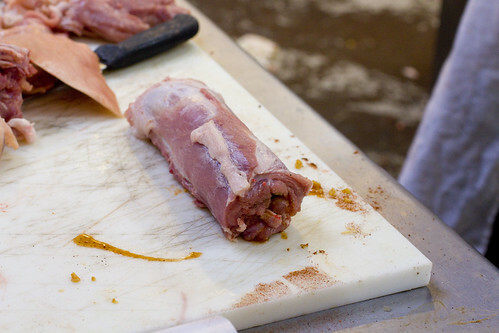 He rolled it up and tied it back onto the rack, finishing off with garlic, parmesan, and paprika. Beautiful and we had never seen this before. 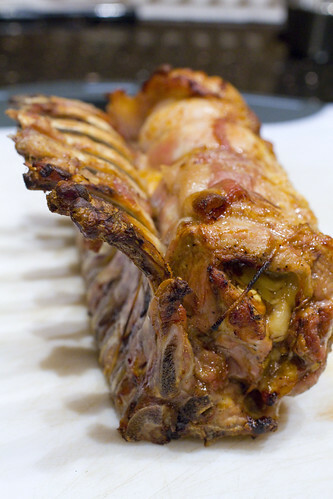 The next day, we covered the bones with some aluminum foil and put the rack on top of some carrots, and roasted it at 300 degrees F for about 60 to 70 minutes, or until it reached 140 degrees F. I let it rest for 1o minutes (as it carries to 145 degrees F) before slicing it. 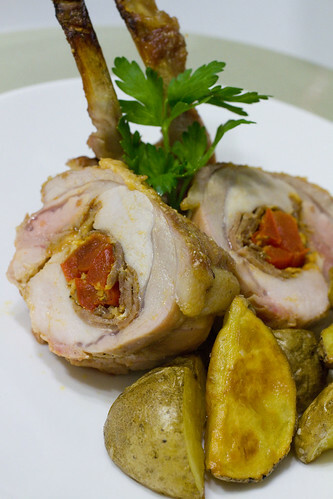 It was perfect with some roasted potatoes. While the class is fairly disorganized (at various times the four of us weren’t sure what to do or where to go), and Essex Street Market can be a bit of a circus, overall it was a unique experience that we both enjoyed. So even though we were invited to join this class gratis, it’s an easy decision to gladly pay for the next one. The only hard decisions is lamb or cow? posted by jessica	at 11:45 AM	Filed under American and New American, Restaurants, Shopping, Video. You can follow any responses to this entry through the RSS 2.0 feed. Both comments and pings are currently closed. What a great class! Thanks for posting the video. Since my wife is half German, I decided to take part of the “gifts” I brought home and make a German style Schweinshaxe. I went over pretty well. The first photo of Jeffrey is a scream. Viscious looking with the knife and the steely gaze. Loved the video and all in all it sounds like you both had a fascinating time. And went home chock full of goodies. Lucky you! That was awesome! I’d love to learn how to do that. How fun! That pork looks delicious. Mike, I had to look up what Schweinshaxe was but it sounds delicious, especially the crispy skin. that’s so awesome..what other part of the pig did you take back…how about the ears? did you take the video w/ your 7D? Great stuff. I would have loved to go to a class like this. Ravenouscouple, we took the tenderloins, some feet, the head (minus skin), bacon, and dry aged porterhouse steak. We did some of the video with the 7D and some with our flip camera. Wow that sounds awesome! 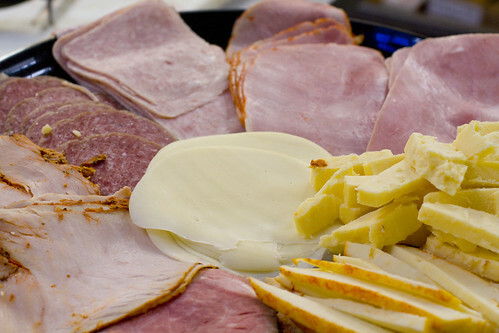 I love the essex market (have you been to Saxelby Cheese? ), but I had no idea they do classes there. Marc, I have had Saxelby but I need some more. We’re trying not to buy stuff right now because we’re moving soon. EMC, maybe you could do it as an anniversary? We have so many shirts we want to make. We should really get on that….